... and how John Lydon, Hugh Cornwell and Rat Scabies feel now about what they said and did back then. We have 5 books up for grabs for the competition. Q1. Anarachy in the UK was originally released on which record label? Q2. What English punk/mod band have sold the most singles of all in the UK charts? Email your answers, along with your name and address. Closing date is Sunday 30th March. Barry Cain will be holding a reading at the Filthy MacNasty's Punk Poster Exhibition on 3rd April 08, for more information please visit?www.myspace.com/77sulphatestrip. 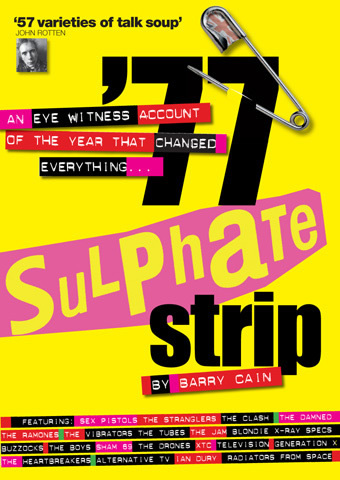 '77 Sulphate Strip is 'Book of the Week' week commencing 31st March 08 in all Zavvi stores.